Right now the City has exploded with horns, police sirens, and people screaming! The Eagles are going to the Super Bowl! Below are four pictures of the second piece I've made this year (and it's already 21 January). My studio doesn't have heat. I have to use my kiln to get it to a reasonable temperature. 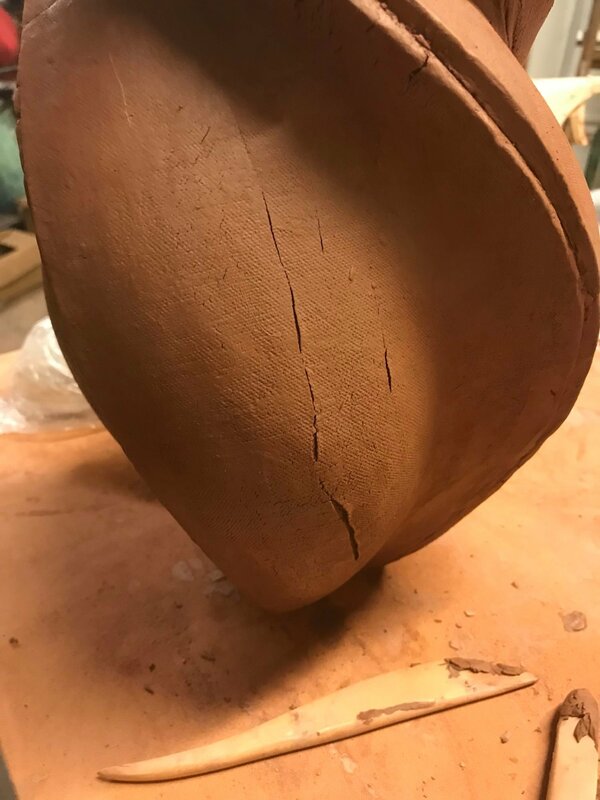 The new body of work that I've been making requires a lot of time and clay that's going to cooperate. Unfortunately, the kiln dries the studio out. So, for the past 5 weeks, I've started 6 pieces and they all failed. Today, I finally was successful with a new form and a new piece. This one might even end up being a bottle. 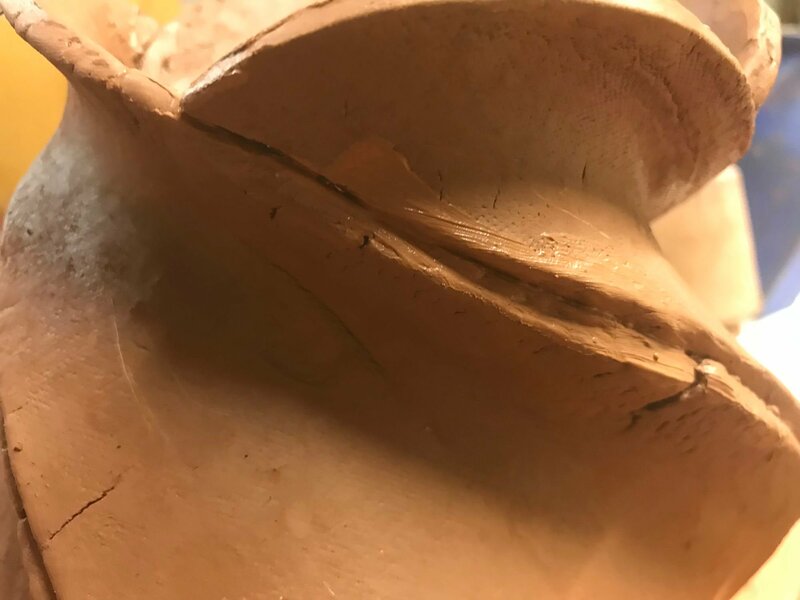 In the pictures, you can see how stressed the clay is. Normally, I roll out the slabs, rough cut each side, and set them out on sheet rock with fans trained on them. 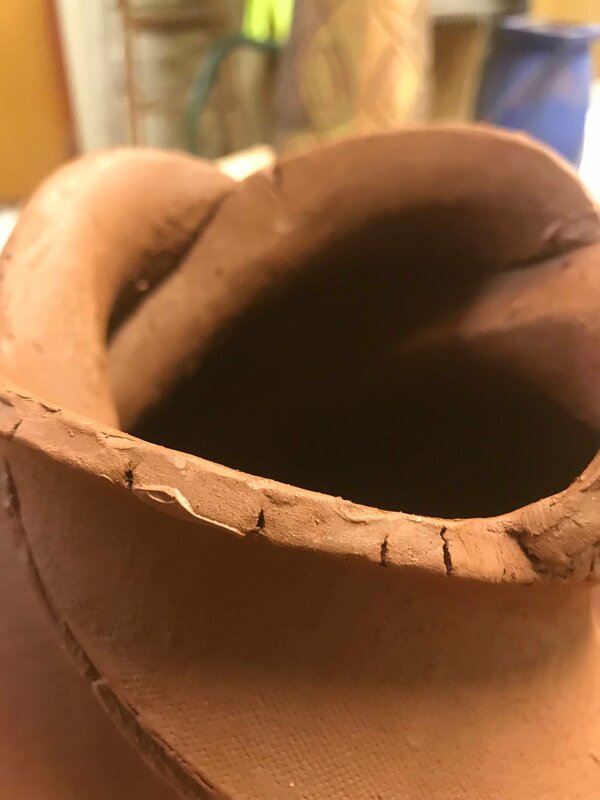 Last night, it occurred to me that maybe I should use an oscillating fan so that i'm not spot drying the clay. I'm using Standard 266 and thought this clay was tougher than it is. I overestimated it. So, I rolled the slabs out, rough cut them and set them on the sheet rock. I covered them loosely with news paper and then went out for about an hour to run an errand. When I came back, they were still too soft, so I set them oscillating fan on high and waited another 30 minutes. Once they were ready, I cut them down, and started to work them. The piece of the template that eventually becomes the "threaded" top, was about 7" long. It kept flopping on the piece and causing the lightly assembled sides to pull apart. So, I decided to cut about 2.5" off the top part and try again. Success. Over 3 hours later, I had the piece stable and ready for the inside coils. I'm calling this body of work, Threaded and Torqued. There's so much forming that takes place AS I assemble. Previously, I could attach all four sides and do a little magic to give the piece volume. Now, I can only assemble the bottom part and then work each side of the piece, partially, until they all are assembled. Early today, I was bitching up a storm about it to my studio neighbor. I just can't let well enough alone. 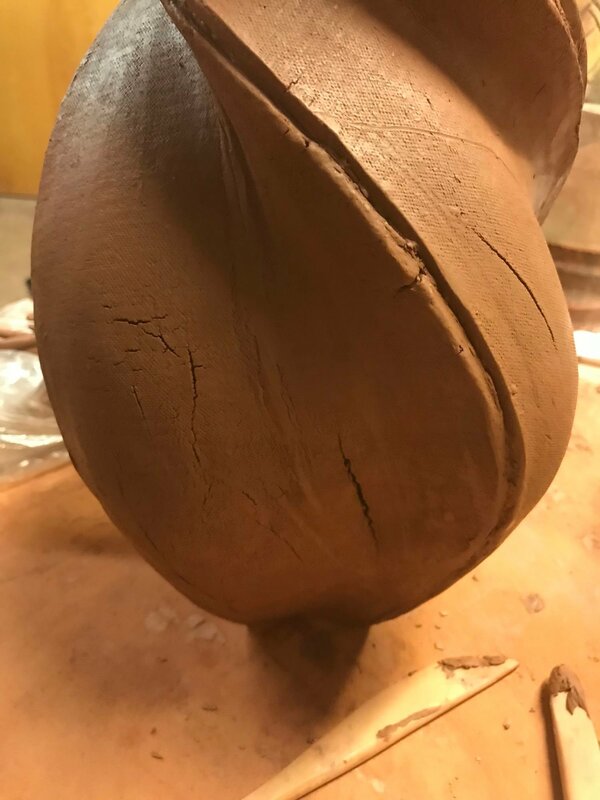 I have to keep pushing myself and the clay further. This time last year, I never would have guessed that I would be producing work like this. So, I'm only THAT much more excited to see what I'm going to do over the next year. I sing when I'm happy and studio = happy!